AMMONNEWS - Dubai Ruler Sheikh Mohammed bin Rashid was pictured on Saturday strolling through the Mall of Dhahran Mall in the Eastern Province of Saudi Arabia. The Emirati Vice President is in Dhahran for the two-day Arab League Summit expected to take place on Sunday and Monday. 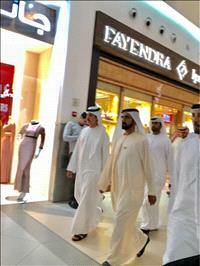 Sheikh Mohammed visited more than one site at the mall.